Playing Game King games for the first time can be a little like watching a latter day Bob Dylan concert. The band strikes up a tune that is lingeringly familiar but arranged in such an obtuse way that it isn't always immediately clear which classic Bob is opting to resurrect. 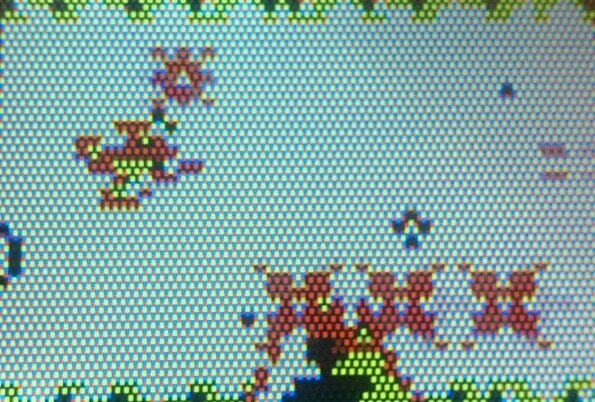 Similarly, when first booting up a new Game King title, It sometimes takes a few minutes before you realise what the programmers intention was and which 8-bit classic they are trying to recreate inside of the little handheld's pixel dense screen. This is fundamentally not the case with Explorer. After a briefly confusing title screen that hints at a 1941 clone (of which two already exist on the Game King) things quickly become more familiar. 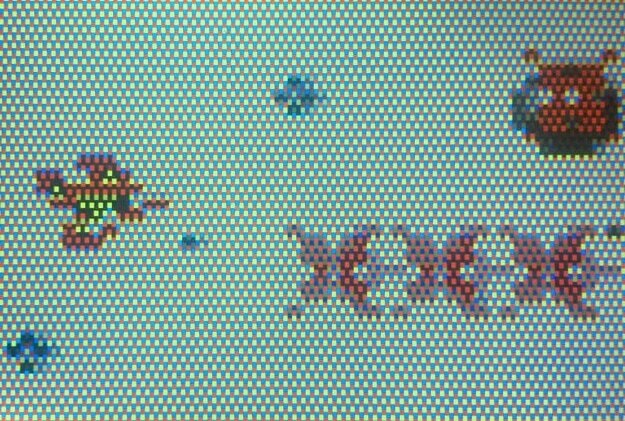 From the moment your little ship is met by a parade of baddies flying in sequence first from the top right and then from the bottom right it is abundantly clear that 'explorer' is the GameKing's homage to Konami's classic shmup, Gradius. The enemy patterns and mountain terrain all come ripped straight from Vic Viper's stage 1 memories. Although volcanic eruptions are, sadly, beyond the scope of Timetop's little wonder. 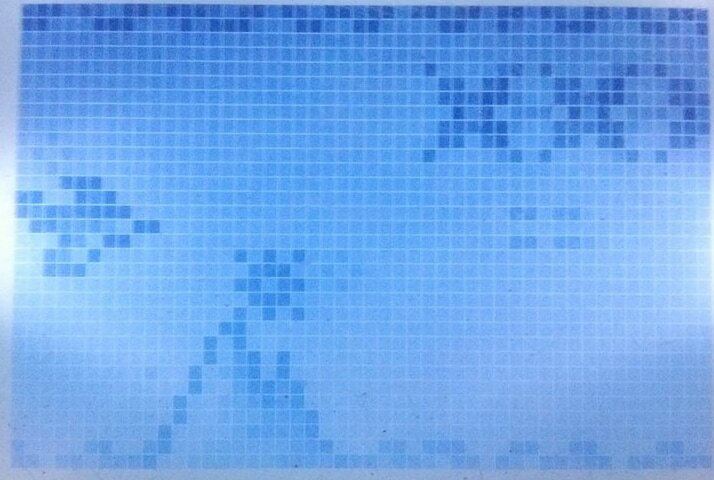 The middle screenshot shows the game as it looks in colourized Game King 3 form! 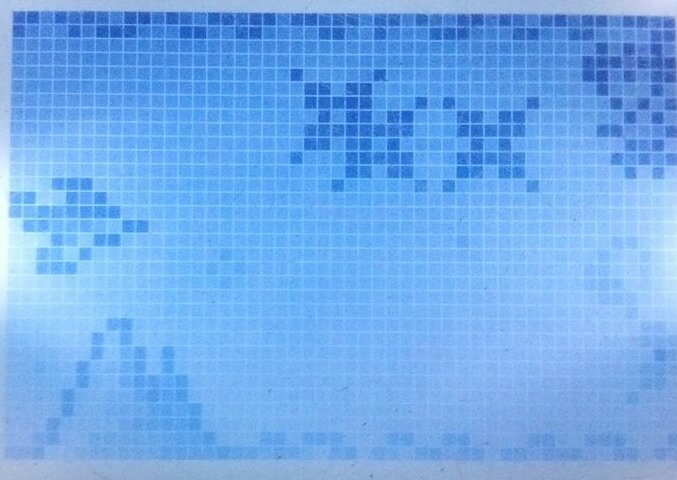 Powerups played a big part in the original Gradius and here they are dropped to similar effect on successful clearance of a line of enemies. 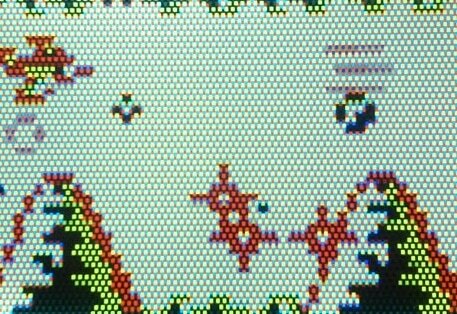 However, the Game King being a somewhat more primative device than anything that its inspiration ever appeared on, does not have the luxury of screen space to display them. Since many Game King games such as Duck Man utilise the pause screen as exactly such a status screen, this seems a missed opportunity by the programmers. What the first few powerups do is anybody's guess (powering up your laser rather than speeding up your ship seems to be the vague idea) but collect enough of them and the alternate fire button can then be used to deploy an infinite number of missiles from your craft's hull, which helps greatly in clearing what, at times, can become an incredibly busy (and deadly) screen. Should you collect further powerups then this can be changed to a spinning 'option'-like orb that rotates around your craft and destroys all enemies upon contact. The enemies themselves follow Gradius quite closely, with the aforementioned drone waves giving way into walker type machines that patrol the top and bottom of the landscape firing missiles and enemy releasing pods that will need some heavy firepower to destroy. At the end of each stage an alien mothership awaits, although these rarely prove as tricky as the often enemy packed stages themselves. 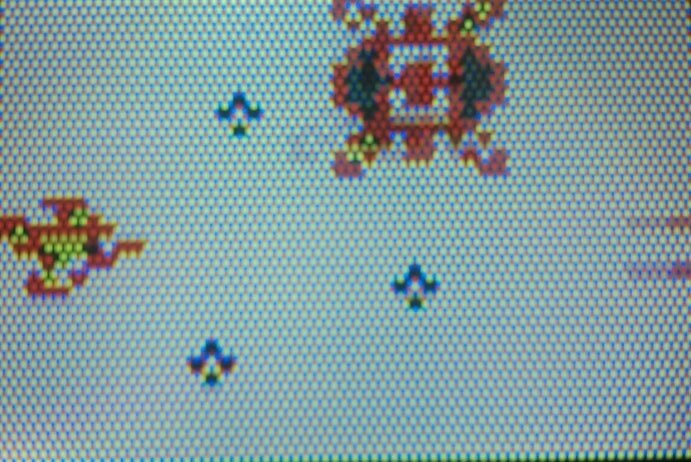 While Gameplay feels much smoother on the original GameKing hardware, the GameKing 3 does a decent job of colourizing 'Explorer' with some suitable hues, even if it does expose the resolution as something akin to your grandmother's cross-stitch quilt pattern in the process! Speaking of challenging. Get ready for a tough one. Explorer is rock-hard. Taking it's cue from Gradius, getting fully powered up and staying that way can turn this challenge around, however as with the latter title, losing your power-ups and going back to that original pea-shooter will pretty much spell your demise. As things stand we haven't made it past the third stage, however that isn't really keeping anyone awake at night as all 3 stages look more or less identical (with the exception of different boss and enemy patterns) and are modeled after the volcanic landscape of Gradius's first stage. Explorer is a rare horizontal shooter on a system swamped by vertical shmups. For the hardware it does a reasonably good job of aping its famous inspiration but it offers little in the way of original level design as a result. The usual looping music sample and decent sound effects are pleasant and it does have something of the 'just one more go' to it which means that persistent players may yet take the time to explore it's challenging levels to the end.